Being overweight and obese often poses a problem to your health and your social activities. When it comes to putting on a fashionable and trendy dress, many find it not possible due to their large and bulky figure. You look glamorous and beautiful only if you have a good figure. Most of you must have wished for a slim and trim figure, but unable to achieve it. If you want to lose weight and get a slim figure, you have to pay special attention to your diet. Only if you have a well balanced diet, will you have a healthy and slim body. Most of you must be confused as to what fruits and vegetables you should include in your regular diet to shed those extra pounds of weight and attain a trim figure. Papaya is one of the best fruits that you can include in your daily diet. It has the ability to melt down the excess of fat present in the body. It is highly nutritious and ensures proper functioning of your metabolic system. It is a rich source of Vitamin A and Vitamin C. These two vitamins help your body to fight against a variety of disease and thus keep your body healthy. Although it is highly nutritious, it has the power to remove extra fat from your body and reduce your weight. Papaya is low in fat and does not contain any cholesterol. It is also low in calories. One cup of papaya cut into cubes contains only 62 calories. As a result it is the right fruit to include in your daily diet. 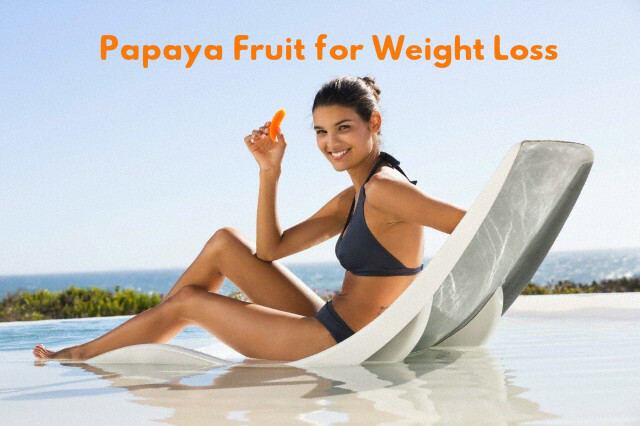 You must be wondering how papaya can help you lose weight. As you must be aware, one of the easiest ways to lose weight is to burn large amounts of calories. Papaya is rich in vitamins as well as riboflavin, iron, calcium and some enzymes. Many of the nutrients useful for the body are found in papaya. It is also an ideal fruit for the proper functioning of the digestive system. Papaya is excellent for solving various digestive problems like constipation, rotting waste and so on. Your body remains fit and fine only if the waste from your body is removed properly and on time. Papaya helps in doing this. When your digestive system and excretory system are functioning well, then you can easily get rid of the unwanted weight from your body. Papaya burns fat and removes all waste from the body. This way it keeps your skin smooth and glowing, and your body slim. Papaya is rich in fiber, which makes it excellent for losing weight. The fiber content in papaya keeps your stomach full for a longer time and therefore keeps you away from overeating. As a result you lose weight effectively. One cup of papaya contains 2.5 gm of fiber. You can consume papaya in its raw form. You can cut papaya in to small slices and have it. It is said that papaya gives you better results when you take it with other food items. It is best when you have it with fat. By making papaya smoothie, you can make your breakfast more delicious and healthy. It is very easy to make papaya smoothie and it does not take much time,. So, if you are very busy and cannot spare much time for making breakfast, papaya smoothie is one the best options. Mash papaya and mix it with milk, yogurt or juice. You can also add other fruits that you prefer like apple, orange, pineapple, melon etc. Now make a smoothie by blending all of the ingredients. If you want your smoothie to be thick in consistency, you can add a banana also. This will give you rich and thick smoothie. Papaya orange smoothie – To make this smoothie, you need two and a half cup of papaya, one orange that is peeled, one celery stalk, one pear, 2 cups of fresh baby spinach and half to one cup of water. Mix all of them and make a smoothie. Papaya apple smoothie – To make this you need 2 and a half cup of papaya, one apple that is cored, 2 cups of baby spinach, one carrot and one cup water. Mix all these ingredients to get a smoothie. You can also try some new recipes with ripe or raw papaya. Making fruit salad with ripe papaya is healthy and nutritious. To make this, cut ripe papaya in to small cubes and add fruits that you prefer to it. Also sprinkle some powdered spices over the salad. The salad is ready. It is delicious and at the same time very healthy. Papaya ginger juice is good for your stomach and is very healthy. It can solve many of the stomach problems and promote digestion. To make this juice you need half of a small papaya, 3 leaves kale, 1/8th of a cabbage, a piece of ginger and a lemon. Mix all the ingredients together by adding some water and make juice. Other than helping you lose weight, papaya also has many other benefits. Being a rich source of fiber and potassium, this fruit helps in keeping your cardiovascular system strong and ensures that it functions properly. It is also good for protecting you from various types of cancers like colon cancer and cervical cancer. The presence of pepsin in papaya ensures proper functioning of the digestive system and digests the food you eat. Papaya is an excellent antioxidant and its seeds are useful for curing stomach pain and infections caused by some fungi. Papaya is also excellent for your skin and keeps it free from various infections and diseases.